The Flying Spaghetti Monsters, after having existed in secrecy for months, have begun recruitment. We are new arrivals in Taella-Oso, having been brought forward by what the developers of Orbus have confused for Gods of Chaos in the dimension of Taella Bruha. The ‘Gods of Chaos’ are actually a single being known as the Flying Spaghetti Monster. Just look at the opening cutscene! You can clearly see the holy noodly appendages poking through a smokey marinara sauce. With thousands, if not hundreds, of devout worshipers, Pastafarianism is widely considered a legitimate religion, even by its opponents – mostly fundamentalists from The Order, who have accepted that our God has larger balls than theirs. Some claim that the religion is purely a thought experiment or satire, illustrating that Intelligent Design is not science, just a pseudoscience manufactured by The Order to push Creationism into the public schools of Taella-Oso. These people are mistaken — The Church is legit, and backed by hard science. Anything that comes across as humor or satire is purely coincidental. Join the Church of the Flying Spaghetti Monster! We have cake. When applying you need to put in a code. The code is the first and last letter of your in game character name followed by FSM. For example: My character’s name is Jenks so my code is JSFSM. Availability to raid around 7:30pm – 11 pm EST a few days a week. Not Fridays. Every Friday is a holy day. If you want to start a West Coast or Central Pastafarian fellowship feel free. For thine is the Marinara, and the pesto, forever. 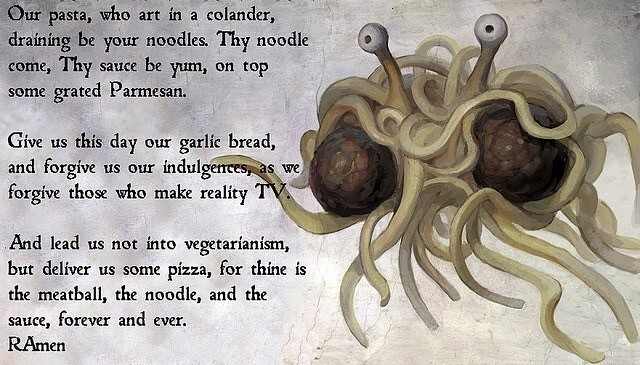 Your thoughts about spreading religious propaganda: ALL HAIL THE MIGHTY SPAGHETTI MONSTER!!! OMG Jenks, this is fantastic! Love it! If I wasn’t committed to Nox then I would be applying. Hope you get some amazing followers! Welcome Lynus! Propaganda is a time-honored, socially-acceptable method of sharing your religion with the world, and we Pastafarians are happy to be part of this tradition. Glad you have joined the ranks of the enlightened. I will be on between 9ish - 12pm ,maybe sooner if nothing comes up. Your thoughts about spreading religious propaganda: Hate spreading any religion but that of the mighty spaghetti monster. Quiksilver, in the name of the Pasta, and of the Sauce, and of the Holy Meatballs I hereby pronounce you a member of the Flying Spaghetti Monsters. I’ll be on discord at 7:30pm though 12pm EST. We can coordinate with Lynus on a place to meet up. No worries. Just hop on discord whenever and we’ll figure it out. But I do! Best of luck! The discord link isn’t working for me. Work got kinda crazy yesterday I’ll for sure be on today. Im so glad orbus has a religion to compeat with the religion of RNG. Yea I can’t understand the RNGesus worship. Why leave something as important as gear to chance? Have the Flying Spaghetti Monster use a noodly appendage to guide the loot to you! Your thoughts about spreading religious propaganda: excuse me sir, do you have a moment to talk about our lord and savior fsm? Your thoughts about spreading religious propaganda: Propaganda is a time-honored, socially-acceptable method of sharing your religion with the world. We must help our fellow humans avoid the dangers of a low-carb diet. RAmen. Post must be at least 20 characters. Your thoughts about spreading religious propaganda: DO YOU HAVE A MOMENT TO TALK ABOUT OUR LORD AND PASTA!? Noodle, JonHirsch, and Pho. I sent you guys private messages, but I’m not sure if you’ve discovered that piece of the site yet. Feel free to hop in discord anytime. We can chat and I coordinate and invite.